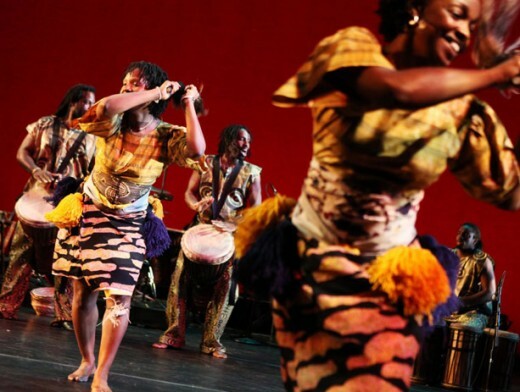 DanceAfrica, the nation’s largest African dance festival, returns to BAM for the 37th year with its traditional Memorial Day weekend extravaganza of dance, music, film, visual arts, and community events. Under the artistic direction of Dr.Charles “Chuck” Davis, DanceAfrica 2014: Celebrating Africa’s Bantaba (“dancing ground”) shines a spotlight on Madagascar for the first time. Music and dance ensemble Groupe Bakomanga of Madagascar, founded and led by Malagasy music star Mariette Rasoarinala, makes its US debut. Madagascar, the world’s second largest island country, with its infusion of African and Asian settlers and French influence, maintains a unique and diverse heritage. Bakomanga embraces this rich varietyof cultural sources, using jubilant accordion-driven music and traditional dance to honor its ancestors, to celebrate the rice harvest and other festivities, and to welcome visitors. Three-time Juno (Canada’s Grammy) award winner Madagascar Slim headlines the May 18 opening celebration with Malagasy-style blues. In addition to dance performances at the BAM Howard Gilman Opera House (May 18, 23—26), the week-long celebration also includes the popular outdoor DanceAfrica Bazaar which hosts more than 200 vendors selling crafts, food, and fashion; FilmAfrica, a BAMcinématek film series at BAM Rose Cinemas; master classes for families and adults; and BAMcafé Live performances, complete with a Late Night Dance Party. A specially commissioned sculpture by Nnenna Okore, with an artist talk and reception on May 25, extends the DanceAfrica artistic vision to contemporary arts. The 2014 recipients of the Samuel H. Scripps BAM Scholarship for post-secondary education will be presented with their awards on the BAM Howard Gilman Opera House stage at the May 18 Opening Celebration. Inspired by the spirit of DanceAfrica, BAM Trustee Richard Feldman launched the Samuel H. Scripps BAM Scholarship Fund in 2008, in memory of former BAM Trustee and arts patron Samuel Scripps. The scholarship exclusively benefits students who have participated in BAM’s arts education programs, including the DanceAfrica Education initiative.